What do you get in these courses? When is the SALE closing? 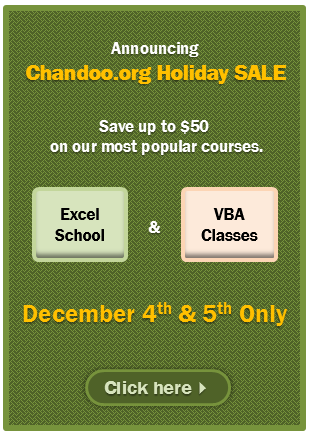 This holiday sale closes tomorrow mid-night – that is 5th December, 2013 mid night – Pacific Time. Go ahead and enroll in one of these courses. Become awesome in Excel. Click here for the holiday sale page. For corporate / bulk enrollments, you get even more discount. Click here for details. PS: This year alone, more than 1,500 people have enrolled in above 2 courses. You too can unlock the power of Excel & make difference in your work. Go ahead and join us.